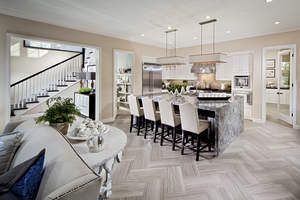 IRVINE, CA--(Marketwired - Jul 17, 2015) - Brookfield Residential's award-winning La Vita neighborhood at Orchard Hills will soon release the collection's second to last phase, prompting homebuyers to act quickly to secure a brand-new luxury home and experience the lifestyle they so richly deserve. With clusters of individual homes in distinctive Italian-inspired piazzas, La Vita connects buyers to a lifestyle of exclusivity and prestige with elegant single-family home designs and a magnificent natural setting within the gated Groves in Orchard Hills™. An array of spacious new home designs are available, crafted with extraordinary architectural elements including dramatic outdoor living rooms with fireplaces; chef-inspired kitchens with large islands and adjoining prep kitchens; unique family retreat areas; lower-level master suites or guest suites; and music rooms or studies. Honored with two prestigious Gold Awards and three Silver Awards at The Nationals(SM) 2015 ceremony, this remarkable neighborhood is one of the area's most sought-after new-home addresses. Interested homebuyers are encouraged to take advantage of La Vita's current phase offering before it sells out. To begin the homebuying process at La Vita, visit the sales gallery today, or for immediate details, log on to www.BrookfieldSoCal.com. "La Vita is a remarkable combination of custom-inspired luxury and old-world charm that homebuyers are finding irresistible," said Mercedes Meserve, Vice President of Marketing for Brookfield Residential Southern California. "With the release of our final two phases just around the corner, we greatly encourage buyers to act quickly and visit our sales gallery as soon as possible." La Vita's four breathtaking home designs and excellent Orange County setting is the reflection of Brookfield Residential's legacy of premier homebuilding in the most coveted locations. From the moment homebuyers cross through the gated entry and into La Vita, they'll notice the distinctive piazzas with private driveways leading to Tuscan-inspired exteriors. The grand two-story designs feature dramatic open interiors that span from approximately 3,400 to 4,000 square feet with voluminous foyer ceilings, 4 to 5 bedroom suites, 4.5 to 5.5 baths, 2-car garages plus storage, and a multitude of impressive features that add both beauty and function. Buyers will find the main level's flowing interior invites easy family time or grand entertaining with oversized great rooms for socializing; gourmet kitchens equipped with prep kitchens and Viking® professional appliance packages and spacious dining areas for formal meals. Just through the great room's bi-fold or multi-slide pocket panel doors is the outdoor covered living room, a coveted space outfitted with a fireplace for added charm. La Vita's upper levels showcase generously sized bedrooms with en-suite baths and unique family retreat areas. Customization options are also available. Homes are priced from the mid to high $1 millions. Created by Irvine Company Community Development, Orchard Hills™ is conveniently located in Irvine, California. In 2014, Money Magazine named Irvine California's No.1 city in its "Best Places to Live" list. The highly acclaimed master-planned community is renowned for allowing residents to enjoy a unique lifestyle unmatched in the region -- some of the best schools in the state; America's safest city for ten straight years; abundant open space, parks and recreational opportunities; and world-class dining, entertainment and employment. For more information about the Villages of Irvine, visit www.VillagesofIrvine.com. To visit La Vita from I-5, exit Culver Dr. and head east. Cross over Portola Pkwy, make a left on Settlers and proceed through the Groves entry gate. Turn left on Fiddlebow, then left again on Sunset Cove. The guest parking lot is located on your right hand side, past the model homes. The La Vita Sales Gallery and model homes are open daily from 10 a.m. to 6 p.m. and 2 p.m. to 6 p.m. on Wednesdays. For more information, please call 888.331.5915 or visit www.BrookfieldSoCal.com. Residence Three at La Vita offers elegant living areas.